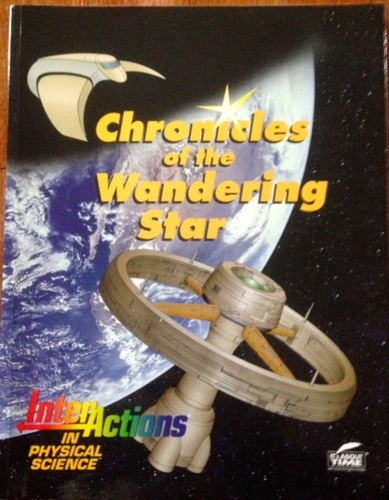 Back when I was a baby writer, I was involved in writing a bunch of science fiction context and short stories for a middle school science project funded by the NSF. The project ultimately went on to be published in a different format and context, orphaning the science fiction. This was a bit sad, but it was work for hire, I got paid for my time and efforts and such things happen. But before the context shift, there was a test version that included an illustrated book of my short stories written for the project. The antecedents are weird, and the stories are all crafted to illustrate specific principles in physical science as supplemental material to go along with the main lessons, but this was the first book I ever had a byline on, and I still have a warm place for it in my heart. It’s recently come to my attention that there aren’t any pictures of the cover up anywhere, so here’s a snapshot of one of my author copies. Time and circumstances allowing, I may add some more images for posterity’s sake. Written by Kelly McCullough, with illustrations by Carlos Lopez.